Four years ago, Florida famously decided the presidential election – and it could happen again. The Sunshine State is in another dead heat with less than four months remaining until Election Day. Florida is crucial every election year, but even more so this time around, as the election takes place in the shadow of the 36-day 2000 debacle. Having gained two additional electoral votes, pushing its total to 27, Florida is the richest prize of any swing state, with just one electoral vote less than the strategically important states of Michigan and Missouri combined. With strong turnout expected, possibly broaching record numbers, Floridians have already faced an onslaught of advertising, and political analysts are genuinely unsure whether the state will go red or blue. Seventy percent of eligible voters cast ballots in the 2000 general election, according to the Florida Department of State, compared to 83 percent in 1992 (an extraordinary amount compared to national averages). Experts say this election should approach or beat those 1992 numbers. More On Florida: Ballot Woes Again on Tap in Sunshine State? "You'd have to say turnout will be high because the state is so competitive," says Susan McManus, an expert on Florida politics at the University of South Florida. "But the real key to victory," McManus continued, is likely to be less about wooing voters, than "get-out-the-vote efforts." Wooing voters in the Sunshine State is not simple. The state is anything but monolithic, in both people and place. The southeastern Gold Coast is GOP territory: white, upper class, Christian. The southwest coast of Palm Beach and Fort Lauderdale is heavily Democratic, heavily Jewish. Both coasts brim with retirees. The southern tip of Florida also leans Democratic. Miami-Dade, the state's largest county, is nearly half Cuban-born, with large numbers of non-Cuban Hispanics, African Americans and Jews, as well. While traditionally Democratic, the area has often swayed to the Republicans thanks to the conservative Cuban-American vote. Northern Florida is the only part of the state that is truly of the South, much more akin to Georgia in culture and makeup than south Florida. It's Republican turf, through and through. In between it all is the I-4 Corridor, a highway in central Florida spanning the width of the state. From St. Petersburg and Tampa, on east through Orlando to Daytona Beach, it passes through 14 of Florida's 67 counties. As of April 2003, there were 9.3 million registered voters in Florida, 3.7 million of them in the I-4 Corridor, according to the Florida Department of State. Of the state's 9.3 million registered voters, about 3.9 million are Democrats, 3.6 million are Republicans and 1.7 million are neither. The bulk of these non-aligned voters live in the I-4 Corridor. "I still always watch the I-4 corridor," McManus says. "It has the decisive independents and non-Cuban Hispanics." John Kerry is looking to the I-4 corridor as well. He is targeting his television advertising to central Florida, according to the non-partisan Wisconsin Advertising Project. Dwarfing Kerry in early Florida spending, the Bush campaign has focused on its conservative base in the Florida Panhandle, as well as in the hotly contested city of Miami. The Bush campaign has spent 20 percent of its early advertising budget on the Sunshine State alone; nearly double that of any other state. A poll conducted July 13 to 15 by American Research Group gave Kerry a 47 to 44 percent lead over President Bush, with independent candidate Ralph Nader at 3 percent. 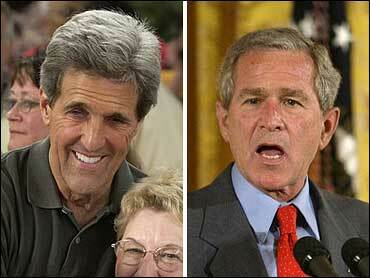 With Nader out of the race, Kerry has a 49 to 45 percent lead over Mr. Bush. Though Nader's impact falls within the margin of error, he still appears to be a siphoning more votes from Kerry. Vice President Al Gore would have won the 2000 election if Nader had been off the ballot in Florida (or New Hampshire). Mr. Bush won the Sunshine State by just 537 votes, while Nader earned 97,488 votes in Florida. Voter News Service exit polling showed that 47 percent of Nader's Florida supporters would have voted for Gore, and 21 percent for Mr. Bush. Experts do not expect Nader to earn anywhere near the votes he did in 2000. But University of Miami political scientist Ben Bishin points out that "when you have an election that can be decided by a thousand votes, ten or fifteen thousand votes could be enough to decide." Bishin adds that Democrats are dependent on a large turnout by African Americans. In 2000, 70 percent of African Americans voted. During the 2002 gubernatorial election, only about 45 percent did, likely contributing to Gov. Jeb Bush's decisive victory over Democrat Bill McBride. In the same election, Gov. Bush (the president's brother) received between 78 and 82 percent of the Cuban-American vote, helping him win mostly Democratic Miami-Dade County. But Bishin sees Republicans once-solid hold over this decisive Florida voting bloc "splintering" between generations. "The first two waves of Cubans were people who fled for political reasons and their property was seized," Bishin said. "But in the last 15 years we have seen a lot of economic refugees and they are almost half of the total population, but maybe 20 percent of the voter population." Bishin explained that more recent Cuban immigrants have not backed many of President Bush's policies toward Cuba, citing increased skepticism about whether economic sanctions have been an effective tool against the communist country. The key to Bill Clinton's win of Florida in 1996 was his surprisingly strong 35 percent support among Cuban Americans. Prior to then, no Democratic presidential candidate had won Florida since 1976. In 1992, former President Clinton only earned 20 percent of Florida's Cuban American vote, contributing to his loss of the Sunshine State. But Mr. Clinton still became president that year, thanks to his victories in several other Southern states. By any measure, Kerry faces the same reality. The Democrat must win Florida or stop the GOP sweep of the South, otherwise President Bush earns four more years in office.